Christmas Eve 2017: How India Is Celebrating X-Mas! Interactive Christmas trees in Delhi, The Flury's and Moulin Rouge in Kolkata, Mount Mary's Church in Mumbai and beach side camping in Chennai are the ways to spead the cheer. New Delhi: With Christmas just a day away, 'tis the season to be merry. People across the country are eagerly looking forward to the Christmas parties, midnight masses, meals and celebrations. Christmas Eve is the evening before Christmas Day and is celebrated with great fervor in anticipation of the Christmas Day which is followed by the New Year celebrations. Streets are all lit up and so are our homes. Christmas trees are almost decked up and ready with fairy lights, bells and stars. Kitchens are all well stocked with plum cakes, candies and wine. Christmas carols are being sung all around. Cribs are almost set up, as Christmas cheer fills the air. 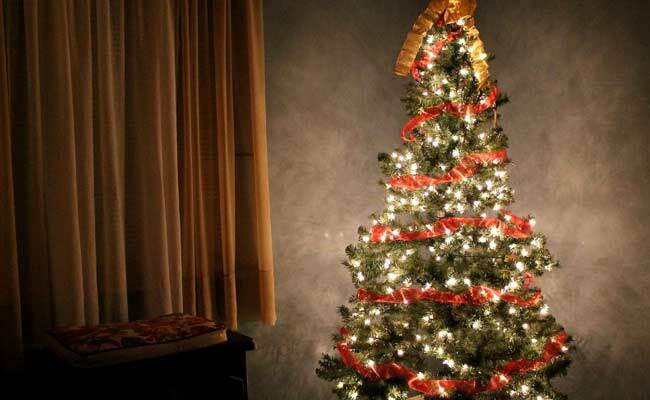 Interactive Christmas trees are the newest addition to the Christmas festivities. It is an artistic installation made of photo frames and LED screens to capture moments of happiness. The Bhutanese Ambassador lit up an interactive tree installed at a top hotel in the national capital. Another hotel in Gurgaon has a Christmas tree made of 500 beer bottles standing tall at 17.5ft. A 5-star hotel has made a 20 feet high ginger bread house using honey, sugar, flour and spice mixes. The midnight mass at Mount Mary Church is the place to be in Mumbai. A quite evening at the Band Stand in Bandra, midnights stroll along the Marine Drive and the great food at the eateries across the city is the perfect way to spread the cheer. From midnight masses, to camping at the beach to parties, Christmas in Chennai is grand affair. To commemorate the 40th memorial year of Charlie Chaplin, a city chocolatier is crafting a life-size statue of the actor and film-maker using over 250kg of chocolate. Christmas in Kolkata and Park Street are interchangeable. The bright lit up roads, the midnight mass at the St. Paul's Cathedral and the great food at The Flury's, Moulin Rouge, Tavern and Mocambo all come together to define Christmas. A new addition on Kolkata's fun street - The Hard Rock Cafe - is sure to add to the party spirit of the city.